Grand Canyon rafting trips are probably the most adventurous way to explore this magnificent wonder along with the Colorado River that created it. There are plenty of ways to do that. 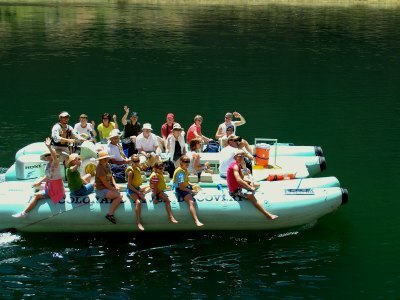 Below you will find some of the best one day rafting tours down the Colorado River departing from Las Vegas, as well as multi-day tours, leisurely family friendly (smooth water) and more challenging (white water rafting) tours departing from the Grand Canyon. This is a luxurious day trip that includes a helicopter flight to the West Rim of the Grand Canyon, landing at the bottom at a private landing ground, a champagne toast and lunch in the quiet Indian Ramada overlooking the Colorado River, plenty of opportunities for photos, and, of course, an exhilarating Grand Canyon rafting tour from Las Vegas. 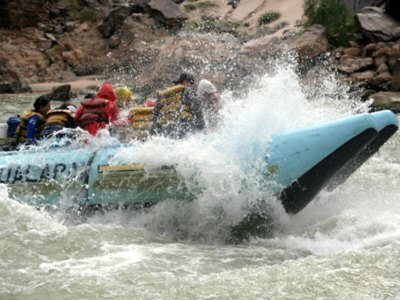 The rafting itself is 11 miles long in a motorized raft in smooth water. This is an excellent tour that will let you explore all the famous landmarks in one trip: incredible views from helicopter of the Hoover Dam and the Grand Canyon, Skywalk bridge, Lake Mead. Plus, you will enjoy fun day out in nature and an opportunity to swim in the river. This trip includes hotel pick up and drop off. This tour departs from Grand Canyon Airlines terminal. You will get on board of an airplane that will take you to Page, Arizona, flying over the East Rim of the Grand Canyon. 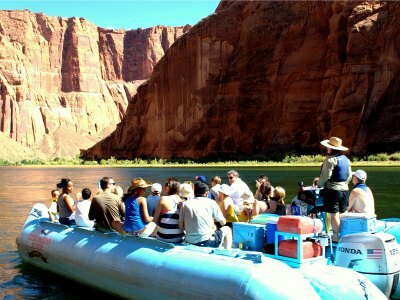 At Page, you will take a jeep tour of the incredible Antelope Canyon and explore its sandstone rock formations before boarding a raft to take smooth water Colorado River rafting trip. In the middle of your Grand Canyon rafting trip, you will stop to explore the ancient Indian petroglyphs along the banks of the river. For Las Vegas visitors who are in a hurry, or who have little kids, this fully narrated tour would be perfect to experience smooth water rafting. 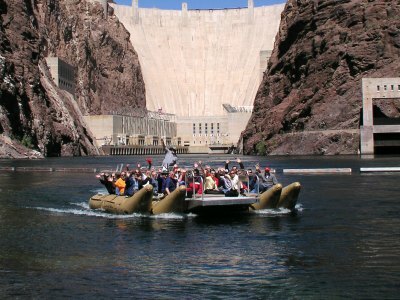 Upon being picked up from a hotel, you will be transported to the Hoover Dam, where you will board a large inflatable raft for a quiet Colorado River rafting experience along the Black Canyon. Your trip will end at Willow Beach, Arizona, from where you will be transported back to your Las Vegas hotel by motorcoach. Prepare to get wet as you explore the caves in search for hidden waterfalls during this exciting 5,5 hour Grand Canyon rafting tour from Las Vegas ! 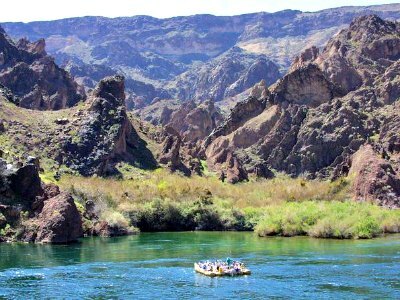 You will be picked up from your Las Vegas hotel and taken to Peach Springs in Arizona, Hualapai land, where your 40 mile (64km) rafting adventure down the Colorado river will begin. Your knowledgeable local guide will take you through class 3 to class 6 rapids, with frequent stops so you could discover the waterfalls and canyons not visible from the river. Lunch box is included in this trip. At the end of this tour, you will enjoy a short helicopter ride to the Grand Canyon West Rim. After the trip you will safely return to your Las Vegas hotel. 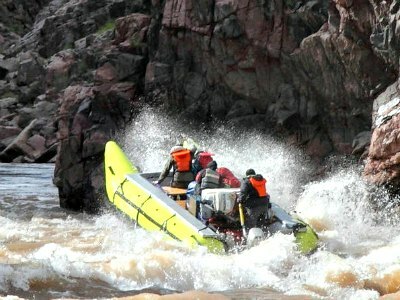 This Grand Canyon rafting trip is similar does not include a hotel pick up and drop off. This tour is ideal if you own or have rented a car and prefer to drive to Hualapai land by yourself. A van will be waiting for you at Peach Springs to take you to the base camp of the Colorado River for your rafting adventure 5,5 hours and 40 miles (64 km) long. After the trip, you will board a helicopter for a short ride to the West Rim of the Grand Canyon. There you will have time to shop for some souvenirs at the gift store. After that, a van will take you back to Peach Springs where your parked your car, and you can return to Las Vegas by yourself. This tour departs from either the Grand Canyon Airlines airport or the Maswick Lodge. This is a very basic tour, very family friendly - perfect for kids as young as 4 years old. An air-conditioned motorcoach will take you to Page, Arizona, where you will take 15,5 miles smooth water Grand Canyon rafting tour starting at the Glen Canyon Dam. This tour includes lunch break and a short hiking stop to explore the famous ancient Indian petroglyphs. 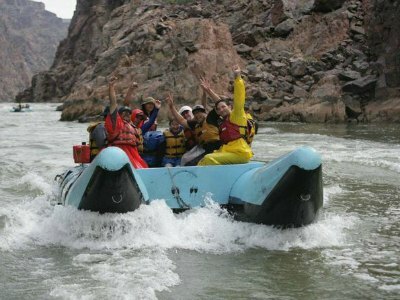 Upon completion of the rafting journey, you will return to the Grand Canyon by motorcoach. Seeing the Grand Canyon from the tourist lookout is awe-inspiring! Just imagine how it feels to raft down the Canyon Colorado River and then soar overhead in a helicopter. Now you can do all this on one exciting trip. Your group will collected at your hotel and set off for Boulder City. Once there, meet your pilot and crew and board the helicopter for a one hour flight over the Grand Canyon West Rim. Learn all about the Hoover Dam and be awed by the panoramic views over the Dam, the Black Canyon and Bypass Bridge. Then fly over the extinct volcano known as Fortification Hill. Your flights circles over the massive Colorado River and the Mojave Desert. Make sure you snap photos of the surreal rock formations, pillars and buttresses. After landing and catching your breath, you will head to the River Launch area where your personal guide will get you settled onto a comfortable river raft. The fun starts as you drift slowly along the river, watching out for wildlife, birds and amazing scenery that will be pointed out to you. Look out for the Great Blue Heron, Big Horn Sheep and Osprey. The high walls of the canyon rising up on either side of you will leave you tingling with excitement as you negotiate the twists and turns. Safety is a top priority and your guide will be with you at all times. When you want a break, the raft stops at a lovely secluded beach where you can take a dip and enjoy a scrumptious picnic while relaxing on the sands in blissful peace. Once refreshed, continue your rafting trip to Willow Beach on the Arizona side. Explore the local stores and buy a hand made souvenir to take home as a reminder of this awesome Grand Canyon Rafting experience. There is nothing more adrenaline filled you can do in your lifetime than take the 2 day White Water Rafting Tour through the Grand Canyon from Las Vegas. Your 2-day paddling adventure begins with complimentary pick-up service at your hotel. As you drive to the Grand Canyon you will pass by the Hoover Dam and travel along famous Route 66. You will stop for a break at Kingman, Arizona where you can purchase breakfast before heading to the Hualapai Lodge. Here you will travel to the base of the Grand Canyon and receive all of your camping gear (if rented). After a quick safety meeting and meeting your expert rafting guide, you hit the water. The first day is packed when you raft through nine separate rapids that can reach as high as class 7. You will stop for a moderate hike to the tumbling waters of Travertine Falls and then continue down the river. There will be lunch stop late in the day and you will set-up camp on a secluded beach near the river. Night time brings stars, campfire and stories while you indulge in a free cowboy style cookout that includes all the fixings. Day 2 you wake up to a hot breakfast before you start paddling down the mighty Colorado River. This day is a little more relaxing with time to take a dip in the water and there is a short nature hike after lunch. 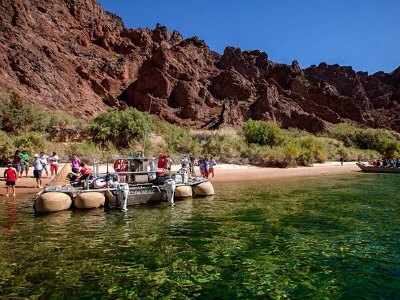 You exit the river at Pierce Ferry where your excursion concludes with drop-off service back at your Las Vegas hotel. What to wear during Grand Canyon rafting trips : In hot weather, wear comfortable shorts and T-shirt on top of a swimming suit - you may stop for a swimming session. Wear either tennis shoes or rubber sandals - do not wear flip flops as this trip is action-packed and flip flops will stand in the way. In cold weather make sure you packed your rain gear, as you may get very wet. Also don't forget to take you sun block, and plastic bag for your camera, money and other belongings.